Aviano Homes: REDUCED! Fabulous custom two story home featuring the desirable Tiena floor plan with four bedrooms, three full baths on a private secluded lot in the heart of Naples. Welcoming entry, atrium courtyard, volume ceilings, crown molding, water purification system, and 2 new A/C units are just a few of the details of this home. First floor with two family rooms, fabulous kitchen with granite countertops, pantry, gas stove, and breakfast nook as well as formal dining, a bedroom and bathroom. Making your way to the second floor you will find two additional bedrooms with adjoining bathroom, loft, Spacious master suite. Heated salt-water pool and spa nestled in the screened lanai and surrounded by lush preserve and tropical landscape, perfect to relax and entertain. Aviano offers a relaxed lifestyle and amenities including: clubhouse, swimming pool, hot tub, and fitness center. Centrally located in the heart of Naples Naples, just minutes away from shopping, dining, I-75, schools, downtown Naples, and the pristine sandy white beaches. Carrington Aviano Condos: The 1st Aviano, Large 2nd floor, End Unit, Coach Home Available, Since 11/2016! 3+Den/3 BA/2 car home w/ 2564 sq. ft. under air with stunning lake view is sold turnkey furnished. Contemporary design w/ volume and tray ceilings and arches. Open great room w/ a comfortable but classy atmosphere. The kitchen features; stainless steel appliances, granite counter tops, center island, kitchen table and breakfast bar. Formal dining area for entertaining. Split bedroom floor plan features a private master retreat w/ lg. walk-in closet and MBA w/ dual sinks, walk-in shower and soaking tub. The 2nd and 3rd bedrooms, each have their own en-suite bath. Large den w/ pull out couch w/ comfortable mattress. There is an elevator shaft for those, who wish to install an elevator. Separate laundry room with cabinets and laundry sink. 2018 A/C. Newer wood floors in main living areas, carpet in bedrooms, dishwasher and microwave. 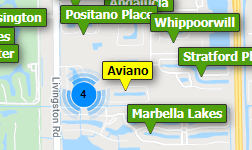 Aviano is a gated N. Naples community with a clubhouse, pool, spa and exercise and social room. Located in prime Naples location and in good school district. Minutes to beautiful Naples beaches, shopping and dining. Close to I-75 and just 20 minutes to the airport. Aviano Condos: C.15234 Beautifully appointed open concept 1st Floor Coach home features include great room with custom crown molding and trim, tile throughout the living areas and newer hardwood floors in bedrooms and den and plantation shutters throughout. The island kitchen features newer LG stainless appliance package, granite counters, upgraded cabinets, walk-in pantry and large breakfast area. The master suite features include a bayed sitting area, lux master bath with separate shower and garden tub and Large walk-in closet. New water heater and large 2 car garage. Aviano is a terrific gated community with large pool / spa, well equipped exercise room and club house. Close to shopping, beaches and downtown. Carrington Aviano Condos: C.12482 NEW CARPETING INSTALLED IN GREAT ROOM, HALLWAY AND GUEST BEDROOMS. SPACIOUS 1ST FLOOR END UNIT CARRAIGE HOME SITUATED ON THE WEST END OF THE BUILDING PROVIDES AFTERNOON SUN ON THE LANAI. LARGE EAT IN WHITE KITCHEN WITH BREAKFAST BAR, SPACIOUS GREAT ROOM AND SEPARATE DINING ROOM. LARGE MASTER SUITE FEATURES WALK-IN CLOSET AND PRIVATE BATH WITH SEPARATE VANITIES AND WALK-IN SHOWER. SEPARATE LAUNDRY ROOM AND ATTACHED ONE CAR GARGE. AVIANO FEATURES A LARGE RESORT STYLE POOL WITH SEPARATE SPA, LARGE WORKOUT ROOM AND CLUB HOUSE / SOCIAL ROOM.GREAT LOCATION CLOSE TO EVERYTHING, SHOPPING, BEACHES AND AN EASY DRIVE TO RSW. Carrington Aviano Condos: Aviano 1st floor carriage home with open kitchen with matching appliances, large eating area, breakfast bar. Upgraded Tile in the living area and den and carpet in in bedrooms. cozy master suite with walk-in closet. Master bath with dual vanities, garden tub and walk-in shower. Private spacious lanai with amazing lake views, attached garage and large laundry. Aviano features a large geo-thermal heated community pool and spa, clubhouse, and modern exercise room. Close to beaches, shopping and downtown. WILL NOT LAST! Aviano Condos: C.14413 Terrific first floor end unit carriage home in Aviano at Naples features open floor plan with tile throughout the living area, bright, white kitchen with granite countertops and split bedrooms. The master features walk-in closet and luxury bath with separate vanities, garden tub and walk-in shower. The large lanai overlooks a serene pond and provides south and west exposure. One car attache garage. Aviano is a small friendly community with large community pool, grill area, clubhouse and well equipped workout facility. Close to beaches, shopping and so much more. Need professional assistance selling your property at Aviano Naples? Find out how an Area Specialist can help to generate more property exposure in order to get the most money for your investment in the least amount of time.